What's this clipboard you keep talking about? 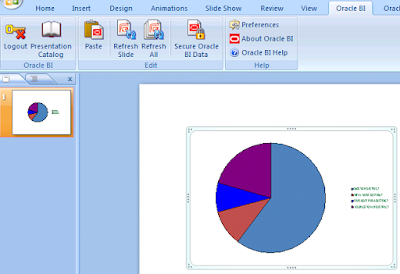 The clipboard (we don't really have an official name for it) lets you copy BI views from Answers or Dashboards and into Excel or PowerPoint using the BI Office Add-in as native Office charts or tables. 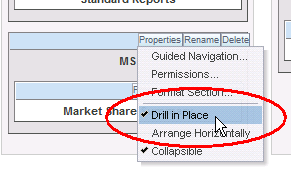 It makes inserting BI content into Office documents simple as 1-2 (one-click to copy, one-click to paste). As a sort of history into the evolution of this feature, when we first started discussing it last year, we wanted to implement something different, a sort of a Windows independent clipboard. People would be able to copy a BI object into the clipboard from Answers or Dashboards, and then a user from Excel or PowerPoint would access that network based clipboard, and insert views. Some iterations later, after discussions between the development teams – the BI Office and the Presentation Services teams – we realized that we could do it in an easier and more user-friendly way. 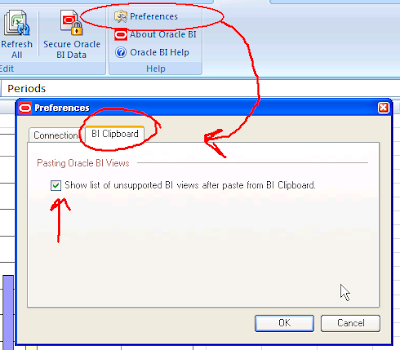 What if we simply copied, into the Windows clipboard, the fully qualified name and path to the BI view that you copied. That would read something like "#shared/Paint Demo/Sales Summaries/Regional Analysis/Regional Revenue|ChartView1" for a chart view named 'ChartView1' in request named "Regional Revenue" that was located under the Shared : Paint Demo : Sales Summaries : Regional Analysis folder path.. Since it was in your Windows clipboard, you wouldn’t need a separate component or product to manage its contents. That worked quite well. Till we started thinking some more. (yes, insightful thought is really a binary process... it can be off for stretches of time, and then when it switches on it can cause a lot of Eureka moments, and some of them with clothes on. Note to self: STOP with these non-sequiturs.) The thought was, wouldn’t it be really, really nice if we could allow users to copy a view in any state (as in let them copy when they are in California, Nevada, Karnataka, and so on). Huh? (Abhinav - these silly and infantile witticisms were cute the first hundred times, not any more!). Let me explain. 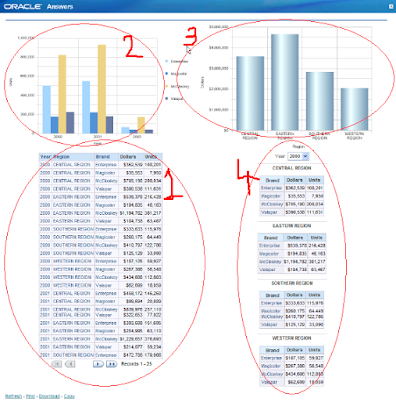 Consider a Dashboard page. Let’s take the demo Dashboard page that ships with the product. At this point, this chart has changed from its original definition. 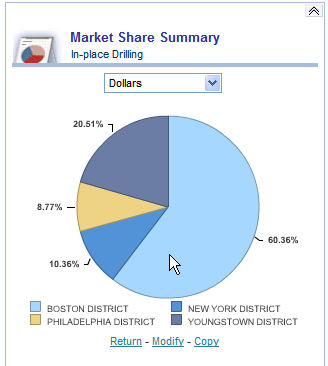 this drilled chart is showing me dollar sales for districts in the 'Eastern Region' (the SQL is: SELECT Markets.Region saw_0, "Markets". "District" saw_1, "Sales Measures".Dollars saw_2 FROM Paint WHERE "Markets". "Region" = 'EASTERN REGION' ORDER BY saw_0, saw_1). If I were to have my BI clipboard working like it was designed initially, you would not be able to copy this modified view. What would get copied would be the original definition of the view. 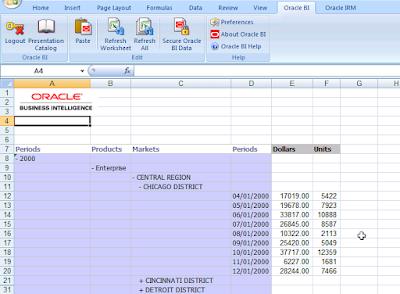 You would copy the chart and when pasted inside Excel or PowerPoint, it would be the chart with sales by region. Good, but not quite there, right? There’s got to be a better way. And indeed there is. 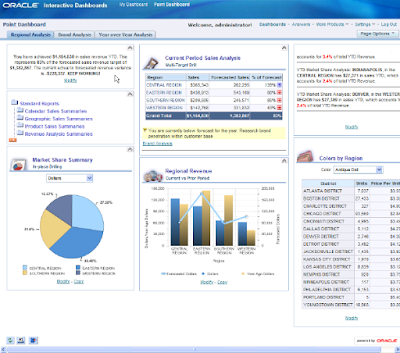 What helped was the knowledge that the presentation services framework has a pretty good state management capability that the BI Office product and the clipboard could leverage. What do I mean? Well, consider this: when I click the 'print' link/button on a Dashboard page, the state of the Dashboard page is maintained and passed to the server that then generates a PDF or HTML version of the dashboard page, sans the header and other chrome that is unwanted in a printer-friendly version of the page. What the team then decided is, let’s copy the state of the chart into the clipboard. 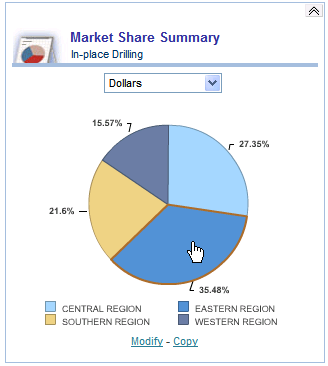 What I mean is, the chart in its current state – sales by district for 'Eastern' region – can be represented by appropriate XML that describes the chart, its format, as well as the metadata that it is displaying. Cool! What does it look like? It? 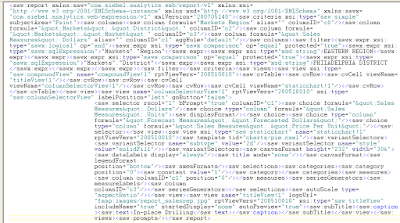 The XML I mean. Ah. That’s good. I likes it. What else can I do with the clipboard? Well... let’s see. You can’t take it home to your mom. Nor can you take it out on a date. But you can go to PowerPoint and paste it there. 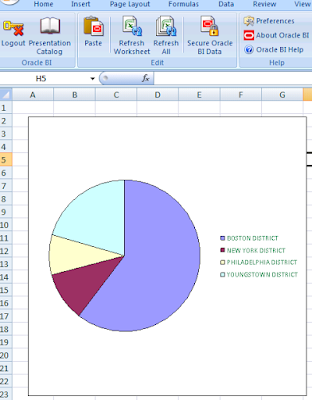 The BI clipboard can take the same XML and turn it into beautiful Office charts in both Excel and PowerPoint. 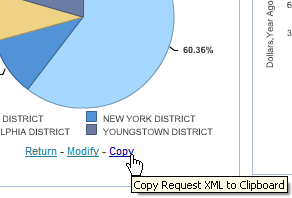 Let me correct that – it can turn XML into Office charts in both Excel and PowerPoint. 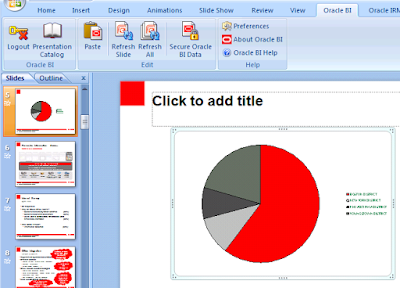 The chart above has inherited the color scheme of the PowerPoint template I am using. The chart above has inherted the default color scheme as this is a new PowerPoint presentation. That’s all fine. A picture is worth a thousand words. But what if I wanted those actual thousand words? What if I wanted a table to be pasted into Excel? With many rows. Many, many rows, more than a thousand rows? Well... be my guest. Take this longer-than-a-picture table with close to 1200 rows. Go to Excel and paste it. Not happy with a table? Prefer a Pivot View? No problem. Here’s the Answers Pivot View. I see. Obviously, Abhinav, you are showing things that you had thought of. Yes sir, and that was quite an effort. But what about compound views? What if I had a table, and a chart, and another table, and a pivot view, and yet another chart, and .... yeah yeah yeah – I see you like compound views. Let’s take a case. Is this the sort of compound view you were referring to? 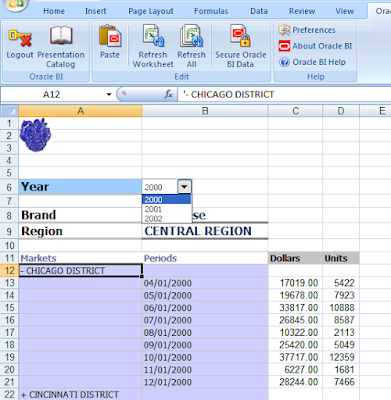 Each table view and pivot view is pasted onto a separate Excel sheet. 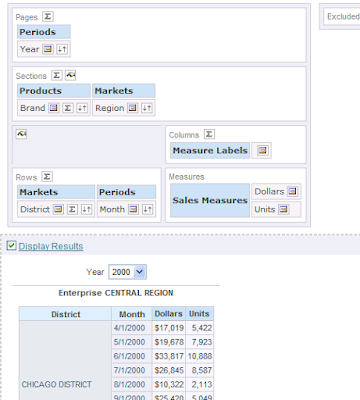 The chart views can share the same sheet as a table or pivot view. 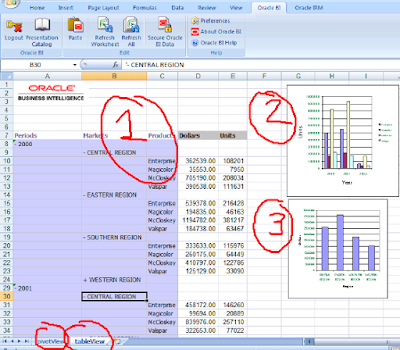 Therefore, in this case, the four views from the request in Answers have been pasted onto two sheets in Excel. But wait! I saw something there!!! What’s this? That sir, is not a wardrobe malfunction (wouldn't that be embarassing?). It’s not even a clipboard malfunction. The honest fact of the matter is (you know I am upto no good when I preface a sentence with ‘to be perfectly honest’, ‘frankly speaking’) that we do not yet support all the views known to the Presentation Services. Therefore, we do not sneak around by not even telling you that these views have not been pasted. Ok, ok, Mahatma Gandhi. But this may get on my nerves. Seeing this message everytime I paste a BI view that contains a title view. So are you going to do something about it?? Check this box, or uncheck it to not see the message about unsupported views. And that marks the end of the post on the BI clipboard. IOW, Elvis has left the building.